Many theologians and Bible scholars believe that Europe will play an especially important role in in end time prophecy, and for good reason too. Daniel 2 & 7 talks both about four empires that will rise to power one after another. The first empire is the Babylonian empire, since the book of Daniel identifies the first. We know from history who the next empires were. After Babylonian Empire fell, the Medo-Persian Empire rose to power. After that, the Greek Empire rose to power. And finally, the Roman Empire rose to power as the "fourth kingdom" of which the passage speaks. Bible scholars are in general agreement as to the identity of these four empires. However, it gets interesting from there. Daniel 7 says that the Messiah will come on the clouds of heaven, destroy the fourth kingdom and set up an eternal empire, the kingdom of God. Furthermore, it says that all rulers will serve and obey the Messiah. This poses a conundrum for anyone studying the passage. How can Jesus destroy the Roman Empire and set up an eternal kingdom of God, if the Roman Empire collapsed 1500 years ago!?!? Jesus clearly didn't command the allegiance of all rulers, and the Roman Empire collapsed gradually, not in a decisive defeat at God's hands. It's untenable to hold that the fulfillment is already past. So the only way for God's word to be true is this: If God sets up his eternal kingdom of Messiah by violently defeating the Roman Empire, the Roman Empire must come back into existence prior to the Second Coming of Jesus. Jesus is not the only guy that will have a Second Coming. The Roman Empire is going to have a second coming too. The revival of political entities in the end times is not without Biblical precedent. Israel had to come back into existence for end time prophecy to be fulfilled. (Ezekiel 38-39) It only makes sense that other political entities may experience a revival in the end times as well. Just like Israel came back into existence, so the Roman Empire will come back into existence. This is why many professional theologians hold that in the end times, a Revived Roman Empire will be present on the world stage. Daniel 7 says that at the time of the Second Coming of Jesus, the New Roman Empire will have some rather peculiar features. Empires usually have one emperor that is a dictator over it all. But this one will be different. It will have ten kings ruling at the same time. That's kind of a weird empire. This clearly doesn't correspond to Roman history, so it must be referring to the end times Roman Empire. Theologians have been saying this for years. In fact, they've been saying something similar for about 2000 years. St. Irenaus (202 A.D.) believed that the Roman Empire would fragment into ten smaller kingdoms, which would be partitioned out to these ten kings. Tertullian (160-220 A.D.) believed that the Roman Empire would collapse and the ten kings would arise out of the ruins of the Roman empire, and the Antichrist would take control of it after it. In Daniel 7, the four empires are depicted as 4 wild animals that rise up one after another, with varying numbers of heads and horns. Later in the passage, the angel interprets the vision to Daniel. The ten kings are depicted as ten horns on the head of the fourth beast. After these ten horns, another little horn rises up among them. This horn gets bigger and bigger, until it uproots three of the original ten horns on the head of the beast. It has "eyes of a man" and speaks arrogantly. The passage goes on to say that this 11th horn is a king who will rise up after the first ten kings. It becomes bigger than its associates. This eleventh ruler will subdue 3 of the 10 kings, speak arrogantly against God, and persecutes God's people for a "time, times and a half a time." This is often interpreted by theologians as a year, two years, and a half a year = 3.5 years. Persecutes God's people for 3.5 years. Is destroyed when Jesus the Messiah comes to set up am eternal kingdom. In Revelation, it also says that the ten kings have a common purpose, and choose to give up their authority to the "beast." In both of these passages the "beast" can refer to the final empire, or its final leader, depending on context. Many theologians believe this event is integral in the rise to power of this pompous ruler. Theologians who correctly interpret these prophecies to be referring to future events all agree that it is talking about the person we call the Antichrist. But the Roman Empire is a big place. From which part of the empire do his ten kings arise? In Daniel 11:35-12:3, we see a very arrogant king who comes during the time of the end. He becomes very powerful in the world through military conquest. It says he does what he does around the time that the dead are raised to eternal life. So this passage is also referring to the Antichrist. We realize that he is coming from a resurrected Roman Empire, so its going to be somewhere in the area of the Old Roman Empire. 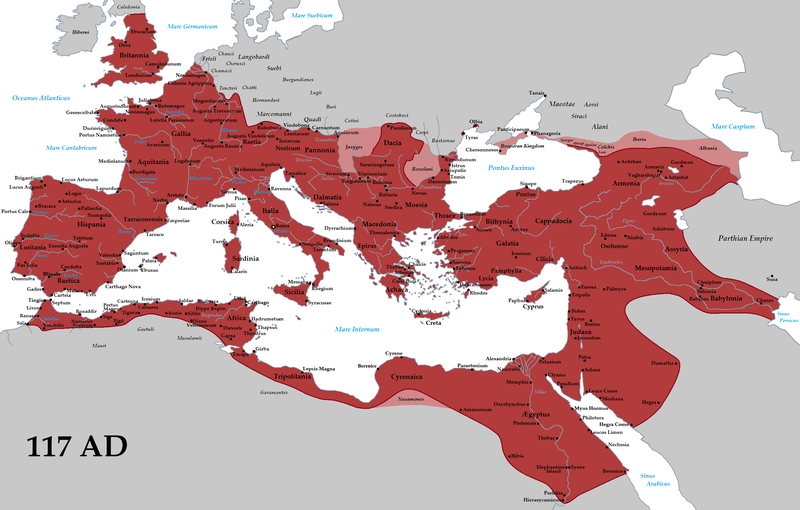 The picture below shows where the Roman Empire was. If one studies those military passages, you will see that the Antichrist goes to war with a lot of people, and wins. The passage tells us that he is attacked by someone North of Israel and someone South of Israel. The Antichrist also takes control of Northern African countries. From the passage. we can see that he goes to war with almost everyone around him.....except Europe. Europe is never mentioned in this passage. Recall that the ten kings are in power before the Antichrist ever comes to the political scene. Since these ten kings are part of the Revived Roman Empire, it only makes sense that they will originate from the European continent. After all, the Antichrist is probably not going to attack his own empire. So it makes sense that he would attack everyone around Europe, but not Europe itself, since that is the home of his empire. Another passage in Daniel gives us a clue as to when he will rise to power. Daniel 9:26-27 speak of a ruler who will make a strong covenant with many for seven years. 1) The one who makes the covenant is of the same ethnicity of the people who destroyed the Jerusalem temple. The Romans destroyed the temple in 70 A.D. So the future ruler must be Roman. 2) The entire prophecy of this passage is decreed for both Israel and Jerusalem. This has caused most end-time theologians to believe that the covenant will be made with end time Israel. 3) The covenant is made for seven years. Scholars who take the passage literally are in agreement that a "seven" refers to seven years. 4) The covenant is also said to be with "many" which one could interpret as being many people in general. No one in the first century made a political agreement which was for 7 years. Furthermore, the passage says that "everlasting righteousness" and an "end to sin" will be in place for Jerusalem and Israel by the end of the seven years. (Daniel 9:24). This points to an end time fulfillment of the 7 year treaty, since there is obviously still sin within Jerusalem! After all, they haven't accepted the Messiah, so it's impossible for there to be an end to sin in that city. However, something nasty happens halfway into the seven years. It says that the covenant creator will stop Jewish ritual sacrifice and offering. Furthermore, it very cryptically says that on the "wing of abominations will come one who makes desolate." This happens until he meets his own end. The "abomination of desolation" is only referenced 3 times in the Old Testament. It's a technical term for an idol being placed in the temple, causing people to stand aghast in horror, leaving the place desolate. The abomination (the idol) causes desolation (abandonment of the temple area). One "abomination that causes desolation" has historical fulfillment in 168 B.C. Daniel 11:31 predicts an event that happened when Antiochus IV Epiphanes placed an idol of Zeus on the altar. Interestingly enough, Jesus says that another abomination of desolation must happen prior to the Second Coming. But this passage mysteriously speaks of the abomination of desolation as if he is a person, not an object. Apostle Paul echos this in 2Thessalonians 2, when he says that the Antichrist will idolize himself in the temple, just prior to the Second Coming of Jesus. Interestingly enough, the Antichrist stops temple sacrifices for half of seven years = 3.5 years. Just like we saw above. But who cares???? Has any of this actually happened? ?